The opposition called a rally to contest the results, but the government and the winning candidate it backed showed no indication of backing down. Accusing the government of “stealing” the presidential election, Georgian opposition forces have called for snap elections and a series of reforms to lead the country out of political crisis. At a December 2 rally to protest the election results, opposition candidate Grigol Vashadze, the runner-up in the November 28 presidential election, demanded that the authorities make major concessions in the country’s system of governance before the winner, Salome Zourabichvili, is inaugurated as president on December 16. “The clock is ticking,” Vashadze said. Vashadze and his supporters allege that the governing Georgian Dream party and its billionaire chairman Bidzina Ivanishvili secured their candidate Zourabichvili’s victory in the runoff vote on November 28 election through mass bribery and intimidation. Zourabichvili prevailed with just under 60 percent of the votes. Vashadze and his team have said they intend to challenge the results in court, and also called for mass protests to pressure the government to hold early parliamentary polls and to put in place mechanisms that ensure that the electoral and law-and-order systems are independent from the ruling party. Dismissive of these demands, Georgian Dream has tried to put a positive spin on the election, emphasizing that Georgia has chosen its first female and foreign-born president – Zourabichvili was born in France and was a French diplomat before entering Georgian politics. That angle was irresistible for some international media. “After Napoleon it’s been rare to have a French person running a foreign country. Bravo Salome Zourabichvili!” gushed French reporter Vincent Hervouet on Europe 1 radio. Zourabichvili’s powers, to be sure, are hardly Napoleonic, and she will take over an office reduced by constitutional reforms to ceremonial status. Detractors say that Zourabichvili, just like outgoing president Giorgi Margvelashvili, deserve little credit themselves for winning their elections and that they were effectively installed in office by the rich and influential Ivanshvili. “Whatever inanimate object Ivanishvili puts in the presidential palace, it will not be our president,” Vashadze said. Vashadze and Zourabichvili, both former foreign ministers, virtually tied in the first round of the vote on October 28, each garnering about 38 percent. Voter turnout was significantly higher in the November 28 runoff, which some observers see as a suspicious psephologic anomaly. A majority of the new voters (almost 338,000 of them, 17 percent of the total votes cast) appear to have backed the establishment candidate. Analysts have two explanations for the outcome. One is that the Georgian Dream and Ivanishvili acquired the extra votes through bribery and intimidation. In the most obvious case, Ivanishvili’s charity group offered at the height of the campaign to write off bad loans for 600,000 Georgians. Zourabichvili gained over 530,000 votes in the runoff as compared to the first round. Analysts also say that the involvement of former president Mikheil Saakashvili on Vashadze’s behalf may have backfired. Saakashvili has a controversial legacy in Georgia and some believe that many voters supported Zourabichvili only as a means of blocking a Saakashvili-backed candidate and thus prevent the former president’s potential return. “Which of the two factors had a decisive impact for the final result?...We will never know for sure,” Ghia Nodia, director of the Ilia Chavchavadze State University’s International School of Caucasus Studies, told Civil.ge. 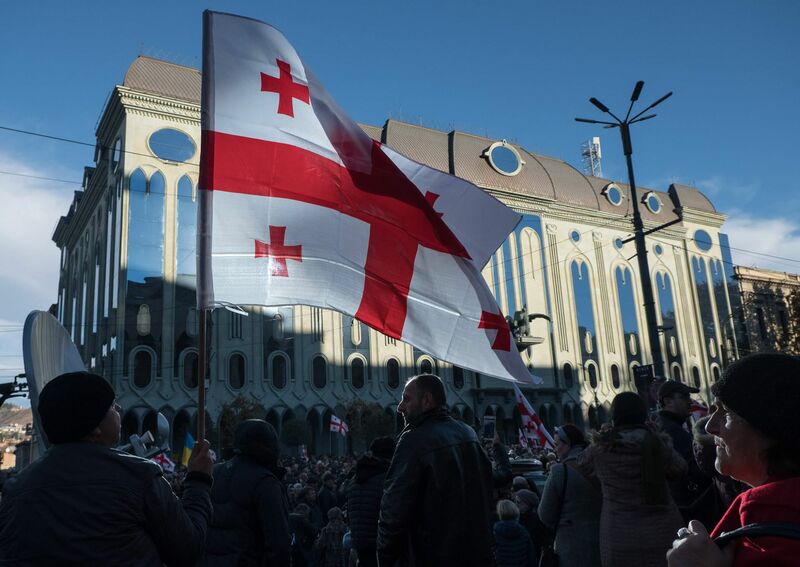 International observers criticized the election for many irregularities, noting the use of both government and Ivanishvili’s personal resources during the campaign, but stopped short of describing the vote as illegitimate. Still, the outcome leaves Georgia with a bitter political battle that is expected to play out in the streets rather than the halls of power.